As one of the kids favourite TV shows, Doc McStuffins has spawned a massive range of toys, games, books and party products from many different suppliers. Posh Paws are well known as one of the best makers of gorgeous soft toys and they have really excelled themselves with their selection of the show’s characters in several different sizes. Dottie, best known as Doc, is the central character of course, and the 20” version of her is beautifully made. Dressed in her trademark doctor’s coat and a pink stethoscope hanging around her neck, she really looks the part! Other large soft toys include Hallie, Lambie and Stuffy as well as a gorgeous version of Chilly with fantastic detailing. 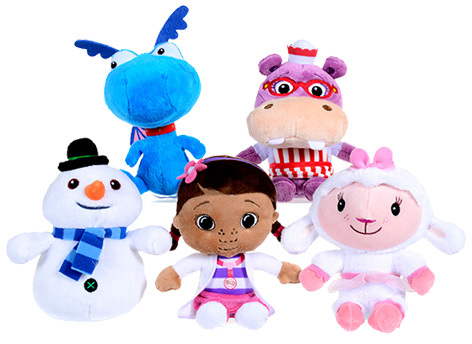 Smaller 10” Doc McStuffins soft toys include Doc, Moo Moo, Bobby, Hallie and Lambie, all of which are terrific interpretations of the characters that kids see on their TV screens every day. Posh Paws have a great reputation as suppliers of high quality plush products that are endorsed by many Disney characters like Spiderman, Dumbo, 101 Dalmatians and The Aristocats. Please tell us what you think of the Doc McStuffins Soft Toys by Posh Paws.